The job market for veterans can be as tricky as it is for everyone else. Fortunately, a bunch of programs are out there to help vets find work, and tax credits encourage movement on the employer side. 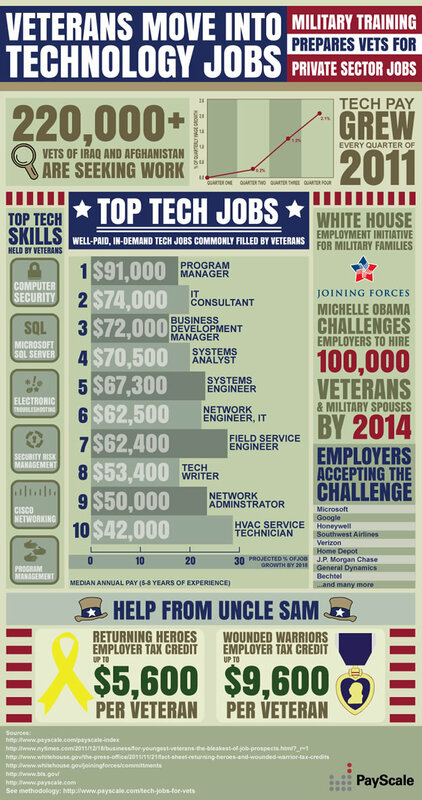 PayScale says tech jobs top the list of positions returning service people are qualified for. To show how military and civilian skills can mesh, it’s put this infographic together. Training means nothing unless you have work experience stop lying to the people. You know, James, I’d be happy to talk to you about this and the notion of my being a “liar.” Actually I emailed you about it, but your email bounced back. So feel free to reach out to me anytime. Apologize to you Mark I don’t believe you are liar, your only reporting what other sources say. I just think some of those other sources are mis-leading or not telling the entire story.